Radiation safety in computed tomography (CT) scanners is of concern due its widespread use in the field of radiological imaging. This study intends to evaluate radiation doses imparted to patients undergoing thorax, abdomen and pelvic CT examinations and formulate regional diagnostic reference levels (DRL) in Tamil Nadu, South India. In-site CT dose measurement was performed in 127 CT scanners in Tamil Nadu for a period of 2 years as a part of the Atomic Energy Regulatory Board (AERB)-funded project. Out of the 127 CT scanners,13 were conventional; 53 single-slice helical scanners (SSHS); 44 multislice CT (MSCT) scanners; and 17 refurbished scanners. CT dose index (CTDI) was measured using a 32-cm polymethyl methacrylate (PMMA)-body phantom in each CT scanner. Dose length product (DLP) for different anatomical regions was generated using CTDI values. The regional DRLs for thorax, abdomen and pelvis examinations were 557, 521 and 294 mGy cm, respectively. 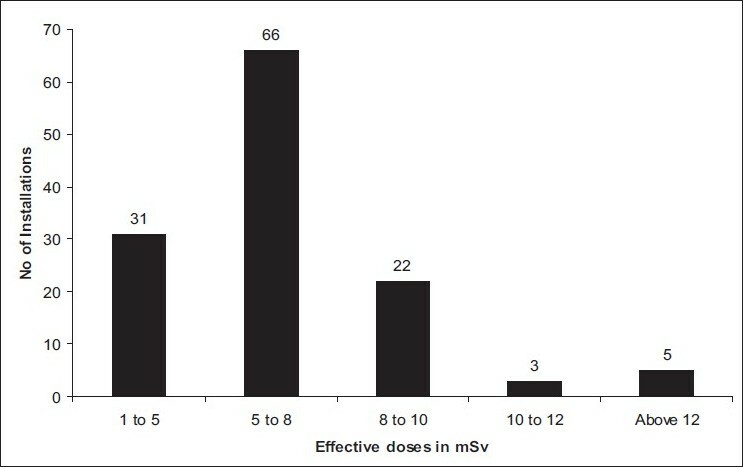 The mean effective dose was estimated using the DLP values and was found to be 8.04, 6.69 and 4.79 mSv for thorax, abdomen and pelvic CT examinations, respectively. The establishment of DRLs in this study is the first step towards optimization of CT doses in the Indian context. It is well understood that radiation effects are either deterministic or stochastic in nature, and occurrence of either of these should be minimized. Deterministic effects are usually characterized by a threshold dose, and stochastic effects include carcinogenesis and induction of genetic mutations. Children are more radiosensitive than adults, hence it is recognized that the risk of children developing radiation-induced malignancies is two to three times higher than that of adults. ,, Radiation safety for patients is always a concern and is dependent on the skills of the personnel performing the examination. The International Commission on Radiological Protection (ICRP) states that radiation doses from CT are relatively high, and technological developments and advances in CT generally have not led to reduction in a patient's radiation dose per examination according to the physical parameters of the patient. Radiation safety is important in diagnostic radiology, not only because of regulatory requirements but also because of personnel and patient considerations. It is reported in literature that weighted CT dose index (CTDI w ) and dose length product (DLP) are appropriate dose related quantities for the establishment of diagnostic reference levels (DRLs) for optimizing patient exposure. , These dose descriptors are available on the control console of most of the modern CT scanners but are not mostly available in conventional scanners. , Recommending bodies such as the National Radiological Protection Board (NRPB), United Nations Scientific Committee on Effects of Atomic Radiation (UNSCEAR) and the European Commission suggestreference doses, in which the CTDI w and DLP are used as dose derivatives for CT examinations. The DRLs are formulated from third quartile values observed for a particular examination since they are useful in identifying centers using abnormally high doses, where patient protection measures are urgently required. This study intends to evaluate radiation safety and doses imparted to patients from various CT installations in Tamil Nadu through a regional survey. This study would be one of the first steps to formulate regional reference levels and safety standards for using CT scanners in Tamil Nadu. where C is the calibration factor for the electrometer, f is the conversion factor from exposure to a dose in air (0.87 rad/R), L is the active length of the pencil ionization chamber (100 mm), N is the number of acquired sections per scan and T is the section thickness. Adequate care was taken during placement of ion chamber in the phantom. 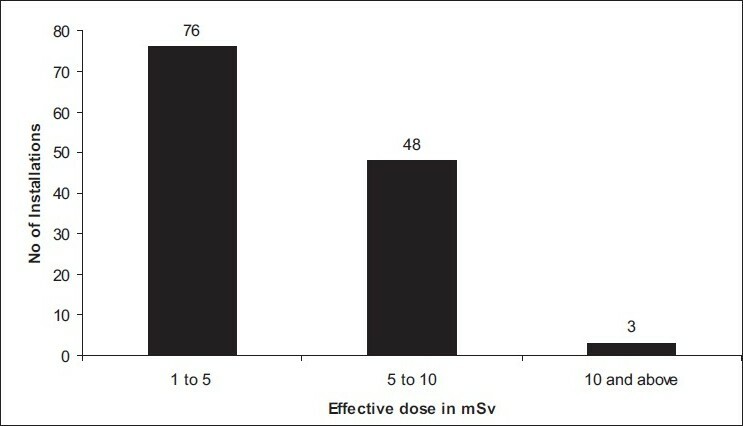 The dose-reduction tools such as dose-modulation techniques were not activated during CTDI measurements. Due to time constraints and problems related to availability of scanners for performing in-site survey, the CTDI measurements were not made in air. In a few modern scanners, dose-related parameters such as CTDI, CTDI w and CTDI vol were displayed on the CT control console. The DLP was calculated using scan length and volume CTDI (CTDI vol ) values calculated from measured CTDI w values. [Table 1] shows scan lengths measured for 1,000 patients from a population in Tamil Nadu. The effective doses were estimated by multiplying the DLP values by normalized coefficients found in the European guidelines on quality criteria of CT since there were no available coefficient values in the Indian context. Radiation scatter measurements were made using a survey meter (Keithley 63100, Ohio, USA) at the control console of the CT room. The objective of this study was to evaluate radiation doses from, and radiation safety in the use of, CT scanners, through a regional survey. The survey covered a total of 147 scanners, out of which 127 scanners volunteered for in-site measurements to be performed. Out of the 127 CT scanners surveyed, 13 were conventional; 11, refurbished conventional; 53, single-slice helical scanners (SSHS); 6, refurbished SSHSs; and 44, MSCT scanners. The SSHSs have been installed since 1995, and MSCT has been in use from the year 2000. Over 13% of the scanners were installed in residential areas; 33%, in commercial areas; and 54%, in hospitals. In Tamil Nadu, a 64-slice CT scanner was also introduced in the year 2000; since then, there has been an increase of over 44 MSCT scanners in the region. Since 2000, 38 SSHSs have been installed in the region. This shows that the number of MSCT scanners installed in the region is increasing rapidly. Most of the MSCT scanners are installed in cities, and most of the refurbished machines are installed in the towns. Information on the manufacturer's name on the CT machine was not available for a few refurbished machines. In this era of technological developments, there are institutions that are still in the process of procuring refurbished conventional scanners and SSHSs. During the survey, it was found that 4 refurbished conventional scanners had been installed in Tamil Nadu since 2004, and this may be due to the low cost involved. Refurbished scanners available in the region were, however, restricted to conventional scanners and SSHSs. The number of patients examined each day in the region was 2,080, which involved examination of 216 patients by conventional CT; 70, by refurbished conventional scanners; 738, by SSHSs; 87, by refurbished SSHSs; and 969, by MSCT. [Table 2],[Table 3] and [Table 4] show effective doses for thorax, abdomen and pelvis CT examinations performed using various CT scanners installed in Tamil Nadu. Effective doses were estimated for the CT protocols that were routinely used in each center. The mean effective doses for thorax and abdomen examinations from refurbished SSHSs were higher than those from other scanners. However, it was also observed that high effective doses were imparted to patients from SSHSs, dual slicer and a 16 slicer due to the selection of high exposure parameters. The third quartile values were used in the determination of the DRLs for the region as this was much suited. [Table 5] shows DLP values and estimated effective doses for each anatomical region and comparisons with those reported in literature. The mean DLP values reported in Tamil Nadu were well within those reported by the European Commission and Hiles et al., Mettler et al., in their study, found that the effective doses reported in literature ranged from 4 to 18 mSv for thorax, 3.5 to 25 mSv for abdomen and 3.3 to 10 mSv for pelvis examinations. 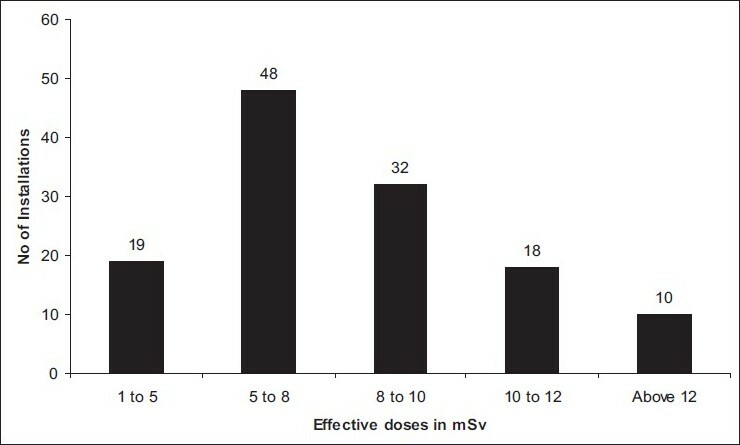 The mean effective doses reported by Kharuzhyk et al. were 6.9 mSv for thorax, 7.03 mSv for abdomen and 8.8 mSv for pelvis CT examinations. The mean effective doses reported in this study were 8.04, 6.69 and 4.79 mSv for thorax, abdomen and pelvis CT examinations, respectively. Due to the increase in the number of CT examinations performed each day, it is necessary that each scanner is provided with dose derivatives on the CT console. [2,20] In the survey in Tamil Nadu, it was found that 74 (58%) scanners had dose descriptors such as CTDI, DLP, CTDI w , CTDI vol and effective doses displayed on the control console of the scanner. None of the conventional and refurbished conventional scanners had dose descriptors displayed on the control console. Out of the 59 SSHSs, 30 scanners had dose descriptors displayed on the console, while all the MSCT scanners had dose descriptors displayed on the console. In the survey, it was found that machine calibrations were performed in 73 centers once in every 6 months or 1 year, while no calibration was performed for the rest of the machines. Routine air calibration protocols were used before clinical work in 16 centers, while 109 machines were restricted to warming up the scanner. At almost all centers, users had limited knowledge of interpreting the dose descriptors displayed on the console, and often these parameters were neglected. [Table 6] shows availability of radiation safety accessories in Tamil Nadu. The room layout and the safety regulations were verified in accordance to the rules promulgated by the AERB. Seventy-two installations had room sizes below the prescribed room size of 25 m 2 . It was observed that most of the operators operating the CT scanner were not aware of the basic concepts of radiation protection. Various centers did not have personnel for monitoring devices, and there was lack of availability of safety placard or warning light. Radiation safety in the Indian scenario is of concern because of the increase in the number of examinations performed each day. Hence adequate orientation and training of personnel are required currently in order to maintain doses as low as reasonably practicable (ALARP). This study presents the results of the initial survey on CT scanners in order to formulate regional DRLs for CT scanners in Tamil Nadu. Significant variation of doses was recorded during the survey, and this discrepancy could be due to differences in scanning protocols and scanner-related parameters. Standardization of protocols and optimization of exposure parameters are required in the current scenario. Personnel operating the CT scanner should be aware of radiation-safety-related issues and have adequate knowledge about dose descriptors displayed on the CT console. Performance of such surveys is essential in various regions of the country in order to formulate national reference levels. Authors would like to thank the AERB for having granted funds for conducting the survey in the region. 1. Hatziioannou K, Papanastassiou E, Delichas M, Bousbouras P. A Contribution to the establishment of diagnostic reference levels in CT. B J Radiol 2003;76:541-5. 2. Livingstone RS, Dinakaran P. Regional survey of CT dose indices in India. Radiat Prot Dosim 2009;136:222-7. 3. Hart D, Wall BF. UK Population dose from medical x-ray examinations. E J Radiol 2004;50:285-91. 5. Huda W. Dose and image quality in CT. Ped Radiol 2002;32:709-13. 6. Pierce DA, Shimizu Y, Preston DL, Vaeth M, Mabuchi K. Studies of the mortality of atomic bomb survivors. Report 12, Part I. Radiat Res 1996;146:1-27. 7. Persliden J, Helmrot E, Hjort P, Resjo M. Dose and image quality in the comparison of analogue and digital techniques in paediatric urology examinations. Eur Radiol 2004;4:638-44. 8. Rehani MM, Bongartz G, Golding SJ, Gordon L, Kalender W, Murakami T, Shrimpton P, Albrecht R and Wei K. Managing patient dose in computed tomography: ICRP special task force report. Ann ICRP 87 2000. 9. Origgi D, Vigorito S, Villa G, Bellomi M, Tosi G. Survey of computed tomography techniques and absorbed dose in Italian hospitals: a comparison between two methods to estimate the dose length product and the effective dose and to verify fulfillment of the diagnostic reference levels. Eur Radiol 2006;16:227-37. 10. European guidelines on quality criteria for computed tomography. Report EUR 16262. European Community, Brussels, Belgium, 1998. 11. Wall BF. Diagnostic reference levels - the way forward. Br J Radiol 2001;74:785-8. 12. Nationwide evaluation of X ray trends (N.E.X.T). Tabulation and graphical summary of 2000 survey of computed tomography. Available from: http://www.crcpd.org/PDF/ NEXT2000 CTPro1.pdf [last accessed on 2007 Feb]. 13. CT scanner dose survey: measurement protocol. ImPACT. Available from: http://www.impactscan.org/download/doseprot.pdf [last accessed on 2009 Feb]. 14. McNitt Gray MF. AAPM/RSNA physics tutorial for residents: topics in CT. Radiation dose in CT. Radiographics 2002;22:1541-53. 15. Hiles PA, Brennen SE, Scott SA, Davies JH. A survey of patient dose and image quality for computed tomography scanners in Wales. J Radiol Prot 2001;21:345-54. 16. Mettler FA, Huda W, Yoshizumi TT, Mahesh M. Effective doses in radiology and diagnostic nuclear medicine: A catalog. Radiology 2008;248:254-63. 17. Kharuzhyk SA, Matskevich SA, Filjustin AE, Bogushevich EV, Ugolkova SA. Survey of computed tomography doses and establishment of national diagnostic reference levels in the republic of Belarus. Radiat Prot Dosim 2010;139:367-70. 18. Wall BF, Hart D. Revised radiation doses for typical X-ray examinations. B J Radiol 1997;70:437-9. 19. Livingstone RS, Dinakaran PM, Rekha S, Eapen A. Comparison of radiation doses using weight based algorithm and dose modulation techniques for patients undergoing biphasic Abdominal CT examinations. J Medical Physics 2009;34:217-22. 20. Verdun FR, Gutierrez D, Vader JP, Aroua A, Alamo-Maestre LT, Bochud F, et al. CT radiation dose in children: a survey to establish age-based diagnostic reference levels in Switzerland. Eur Radiol 2008;18:1980-6. 21. AERB safety code. Safety code for Medical diagnostic x-ray equipment and installations. AERB/SC/MED-2 (Rev. 1); 2001. Saravanakumar, A., Vaideki, K., Govindarajan, K.N., Jayakumar, S.